The Knowledge Graph as we know it may change very soon. Google surprised many this weekend by testing ads on their Knowledge Graph. The car knowledge graph format is a relatively new feature of the Knowledge Graph, which was announced by Google just two weeks ago. This makes it the perfect platform to test Knowledge Graph ads. What’s noticeable about this ad that Google is testing is that they’re displaying ads based on a user’s location. 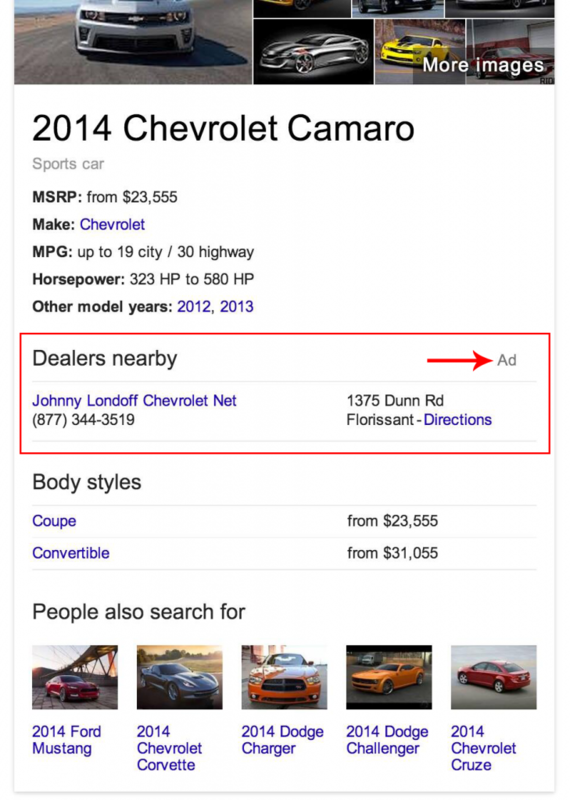 The ad shown in the image above looks to be relevant to the Knowledge Graph entry, as it is a Chevrolet car dealer located in Missouri. The listing features the address of the local dealer and displays the contact number as well. No word yet on what other features will be included in Knowledge Graph ad listings. What’s missing from their ad format is enough emphasis to distinguish the ad from the Knowledge Graph entry. Aside from the tiny label “Ad” on the upper right corner of the ad, there’s nothing that makes the ad stand out from the rest of the entry – no box, no highlight whatsoever. Because ads on the Knowledge Graph are still in the testing phase, you have enough time to prepare your campaigns. A solid local SEO strategy will make Google see you as a relevant local provider. Updating your business information on your Google+ business profile helps ensure your ad will display relevant information on the Knowledge Graph ads when they are implemented across all Google search properties. Talk to your account manager today and find out how we’re preparing and strengthening your local SEO efforts in line with this new feature. Sign up to become our partner and get access to our complete SEO solutions today!